It was midsummer 2004 when I went to the midnight showing of Sam Raimi’s Spider-Man 2 Starring Tobey Maguire and Kirsten Dunst. I was a huge spiderman fan starting when I was eight with the 1994 Spider-Man cartoon. I still have a copy of “The Sensational Spider-Man #0” which has appreciated in value by an impressive 98% making it worth almost $3. 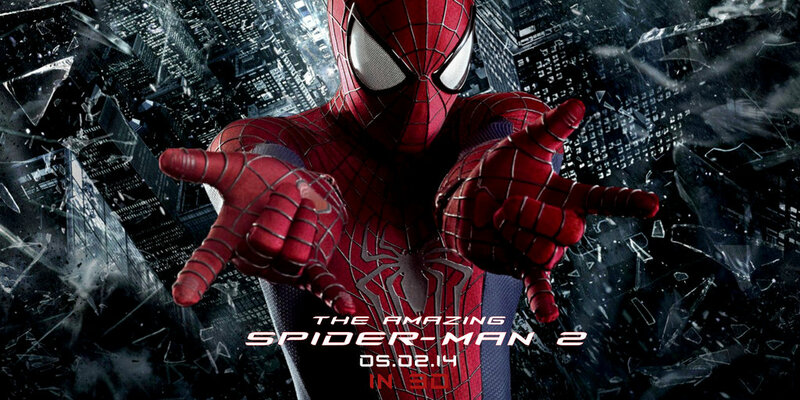 I really enjoyed the first Spider-Man movie, so I was primed to be a huge fan of Spider-Man 2. Many think it was the best of the original trilogy. It was one of the few examples of a sequel being arguably better than the original. So here we are, ten years later – what about this new second installment? You should first know that I didn’t dislike the first Amazing Spider-Man movie, but that It didn’t knock my socks off either. I so identified with Tobey Maguire; he was so perfectly uncool – so totally nerdy that I identify with the guy far more than Andrew Garfield. But the biggest issue with the first chapter of this new Spider-Man is that we basically knew what was going to happen for the at least first half of the movie because we’d already seen it. Getting bitten by a spider, gaining powers, not stopping the guy that would go on to kill uncle Ben – that was all necessary to establish the “new universe” but we as an audience didn’t need to see it again. It was good. It was well done. It was arguably better than the first time around, but since it had been done well before (and just a short ten years before) it made the movie feel boring to me. I recently re-watched it and found that I enjoyed it much more the second time around. Emma Stone is really what makes the movie. Andrew Garfield is great, but seeing a love interest that is as invested in Spider-Man as the hero himself is the strength of the movie. Andrew Garfield is also better at the comedic quipping that I do especially love about the character of Spider-Man. So you know that I enjoyed the first movie, but not as much as the original trilogy. So how did I like the sequel? Basically I found it to be exactly what it had to be, but that doesn’t mean everyone will like it. The movie opens with the same scene that the first movie opened with, only instead of being told from the perspective of young Peter Parker – it’s told from his father’s view. We then follow him after his disappearance to find out about what happened to him after he dropped peter off with Aunt May and Uncle Ben. There’s a high adrenaline scene in which we find out that Richard Parker has some kind of information on his laptop that he’s transferring to a secret location as he and his wife are fleeing the country. I won’t totally spoil how the scene ends, but it is action packed and I will say (possible spoiler) it is still unclear as to exactly what happens to Richard Parker, though we’re certainly lead to believe that he may not be alive. Back to the present day and Spider-Man is in the middle of stopping Paul Giamatti (who I love for not being above this bit role) from stealing some plutonium that, surprisingly, has nothing to do with the rest of the movie’s plot. I thought this was odd because to paraphrase Chekov, “If you show weapons-grade plutonium in the first act then it must make someone a super villain in the third act.” But I suppose to paraphrase the mis-quoted Freud, “sometimes weapons-grade plutonium is just weapons-grade plutonium.” This scene is basically just setting up how life normally is to Spider-Man/Peter Parker these days. Meanwhile Gwen Stacy is giving her valedictorian speech at their high school graduation, for which Peter is running late. He makes it just in time. Shortly after we have a little teen angst as Peter and Gwen re-break-up because peter keeps on seeing Gwen’s Father everywhere. At one point they’re even nice enough to roll the clip from the last film of the dying Captain Stacy making Peter promise to not get involved with Gwen. Here’s where the plot effectively splits into four different mutant sub plots. 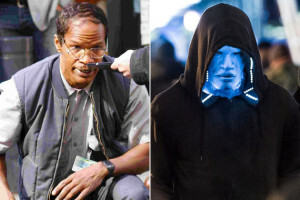 At the same time we’re introduced to Max Dillon, played by Jamie Foxx. Max is saved by Spider-Man and develops a pitiful obsession with him. We’re shown that Max is a nobody who was cheated by his employer, Oscorp, when they stole one of his ideas for a power plant that is now powering all of New York City. He’s such a sad person that when he falls into a vat of electric eels and gains electric powers we’re almost on his side. Then there’s the on-going love story with Peter and Gwen. The fact that he checks on her every day even though he’s not maintaining contact with her is not at all creepy because it’s Andrew garfield. Though if Paul Giamatti had been in the role of Spider-Man I think they would’ve called this “stalking.” When they finally go on a date again (less than 20 minutes of screen-time after they broke up) we add the tension of the fact that Gwen is considering going to Oxford for college. (The one in England.) There is always the underlying tension of Peter’s promise to Gwen’s father to stay out of her life. 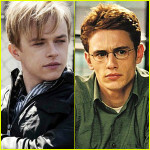 Plot number three comes in the flavor of the movie’s most interesting new Character, Dane DeHaan playing the new Harry Osborn who, of course, is a mixture of Harry Potter and Jason Bourne. 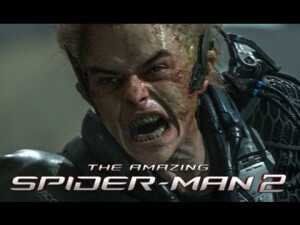 This iteration of Harry Osborn immediately has more pathos than James Franco’s Harry. Because 1) He’s not James Franco. 2) –possible spoiler– His dad dies at the beginning of the movie 3) We find out he is dying of the same thing. Harry wants to pick up where his father’s evil company left off in trying to discover a cure for the made-up disease that’s killing him. For some illogical reasons Harry believes that Spider-Man’s blood might be the answer to his problems. Because. . . spiderman. This is complicated by the fact that Harry and Peter were childhood friends. While DeHann has more gravitas as a performer than Franco, he sounds and looks like he’s about 15 which took me a while to get over since he’s promoted to CEO of a large company after his first scene. d in. This also answers one of my biggest problems with the first “Amazing Spider-Man.” With the first movie I was bothered by the fact that Peter entered into an easily accessible room full of thousands of spiders and was bitten by one and got powers. I wanted to know why no one had been bitten before or since by these spiders and gotten powers. Well it turns out that when Richard Parker created these “Human/Spider Hybrids” he used his own DNA so only someone with his same genetic makeup could reap the benefits of their genetically enhanced venom. So there you go. That’s why peter was the only one who could get powers. ways it could be compared to The Dark Knight in that it is darker, than the first and has a villain that doesn’t show up until the movie feels like it’s already supposed to be wrapping up. But the thing I liked about it is that it felt more like a multi-part story within the ’94 Spider-Man series. Because there were several seemingly unrelated bad guys. 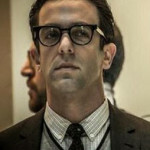 It’s also fun because they introduce us to other characters we haven’t seen before on the big screen, but are long-time Spider-Man regulars, Like Alistair Smythe, played by BJ Novak, who later goes on to become “The Spider Slayer” and Felicia Hardy, played by Felicity Jones, who eventually becomes Black Cat. 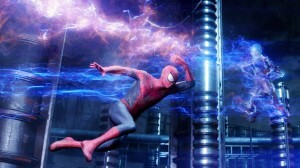 The point where this all comes to a head is after Spider-Man tells Harry that he won’t give him any of his blood, and Oscorp tries to oust Harry just as he’s been told that some of the genetically enhanced spider venom was kept after the spiders were destroyed, and Harry discovers that Max (now Electro) is being held at Revencroft, the Arkham Asylum of the Marvel Universe. After Harry unleashes Electro and forcibly takes Oscorp back, he then enters a secret room at Oscorp that basically has the power sources of all the remaining spider-man villains; Doc Oc’s arms, Green Goblin’s glider, the Rhino’s suit, and some other things. When harry finds the remaining venom and injects himself with it he turns into the Green Goblin and hops on the glider like he’d done it a million times before. That part seemed a little rushed to me. All the while Electro has pulled the plug on the entire City of New York. We’re reminded of how terrible this would really be as incoming planes can’t contact the tower and Aunt May is struggling at a hospital to care for patients. Then we come to the final battle with Electro, but it’s really pretty amazing how little we care about him at this point, considering he’s played by the most famous person in the movie. Gwen shows up to help and actually comes up with the idea that finally defeats electro. At this point a normal movie would end, but not this film. We’ve still got another bad guy to defeat. You’ve been warned, the next few paragraphs contains the biggest spoiler of the movie. After the green goblin shows up and puts together the fact that Peter Parker and Spider Man are the same person because Gwen Stacy is hanging out with Spider-Man. (a stretch, I grant you.) they fight a while. Here’s the issue with this: We didn’t care as much about the battle with Electro, because Harry had been established as the main antagonist. Now we’re a little battle-weary by the time Harry actually shows up as the Goblin and so we don’t care as much about the battle that we were more curious about in the first place. Then we come to the conclusion of the fight as the Green Goblin drops Gwen off from a high place. Spider-Man finally manages to dispatch with the Goblin, knocking out so easily that you question why he didn’t do it before. Gwen is falling amidst the debris as Peter shoots a web down to her we shift into that combination of slow-motion accompanied by a particular dramatic theme that tells you someone is going to die. Gwen hits the ground milliseconds before the web makes it to her. She hoists up and Peter lands by her. For a few moments I was convinced that she was going to wake up. I’m rarely really shocked by a movie – especially a superhero movie, but this one surprised me as I realized – they killed Gwen. Matt Williams reminds me that this is canonical, that Gwen died in a manner very similar to this in a issue of the comic in the 70’s, but it still is a bold choice for the mood of Spider-Man. 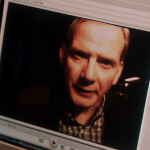 The following scenes show peter staring at Gwen’s grave across multiple seasons. We’re told that Spiderman hasn’t shown up for five months. You read that right. The movie’s timeline continues five months after the climax of all the plots. The final scene is actually quite fun, as Spider-Man finally shows back up in a tear-jerking moment and fights Paul Giamatti again, now in the Rhino battle suit. The denouement feels a little like Return of the King because it has multiple endings. But that is a better alternative than concluding on the note of despair that it could’ve closed out with. Marc Webb chose to not end the movie in the dismal hopelessness that we were left with at the end of The Dark Knight. I’m very glad he did. Spider-Man isn’t about indulging in the darkest moments of life. Even though he has some marked similarities to Batman, I appreciate the fact that this installment of Spider-Man, while the darkest one ever, sticks around long enough to leave us with some hope. Ultimately in spite of the issues I have with it, I find it to be a fun movie. It over-stays its welcome by about 20 minutes, but I care enough about the characters to hang on. The character of Gwen really does carry much of it for me still. I did really enjoy Spider-Man’s quipping and antics in this one. It feels very much like the recent cartoon “Ultimate Spider-Man” which takes place within a similar continuity and is a lighter fare than most incarnations of the web-head. So while it does go darker than other iterations, it maintains an appropriate level of humor to relieve the tension. Things I would’ve like to have seen: The deleted scene featuring Mary Jane meeting Gwen Stacy would’ve been fun. It’s pretty well known that Divergent star Shailene Woodley filmed a scene as Mary Jane Watson that was cut. It would’ve been fun to see this set up for the next movie. I hope Woodley isn’t too busy for the next Spider-Man, but it seems likely she won’t have time with her current schedule filming the Divergent sequel movies. I also would’ve been glad for them to bring back Norman Osborn at the end, revealing that he faked his death so that Harry would try the serum on himself. It seems like something Norman would do and also it would open up some interesting possibilities for the next chapter. I’m going to give this one 3.5 out of 5 stars, but only because I’m rounding up. It’s definitely enjoyable and definitely worth seeing, but not without it’s issues. The pacing is awkward – the first half felt slow as it was spent setting up the four plots. The second half felt rushed in resolving them, the final few minutes felt somewhat superfluous after multiple battles had been resolved. But the battles are lots of fun and in comparison to the supremely awkward pace of Spider-Man 3, it was a paragon of storytelling. Go see it for yourself and if you already have seen it, do you agree? Do you disagree? How’d you like it?